Step into the newly opened Marriott Marquis Chicago and you’ll see OCL featured throughout its 93,000 square feet. Designed by Chicago-based Anderson/Miller Ltd., in collaboration with lighting designer Anne Kustner Lighting Design, and design architects Gensler and Goettsch Partners, the Marriott Marquis Chicago is set to revolutionize hotel and meeting standards with its high-tech amenities and style. 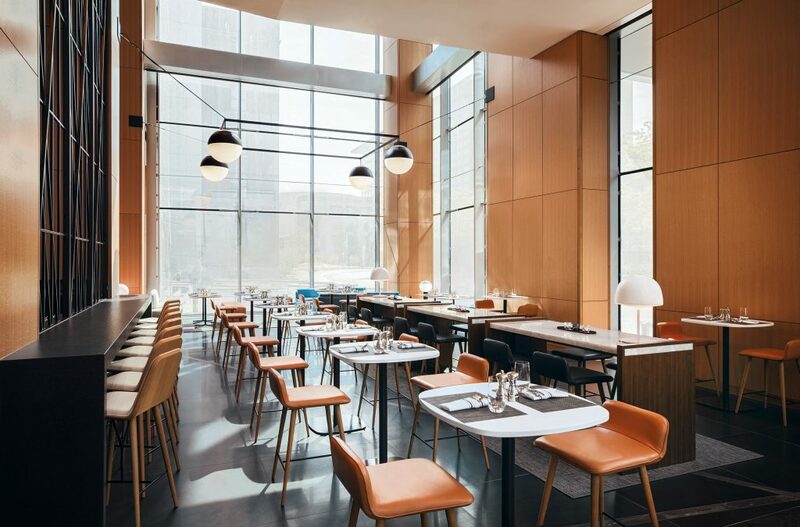 A juxtaposition of clean, contemporary design, mixed with Chicago’s heart and history, the glass hotel soars above the historic American Book Company Building originally built in 1912. The hotel serves as a stunning example of beauty and practicality melded together perfectly in Chicago’s South Loop. 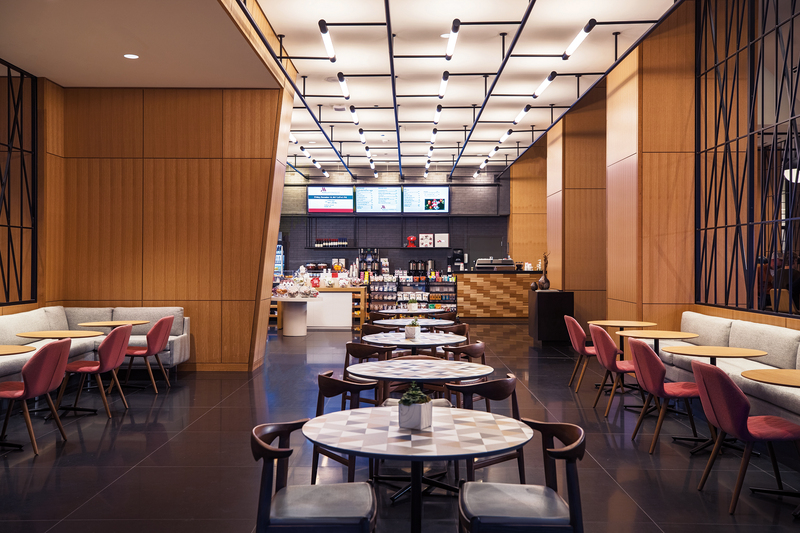 2121 Pantry, the signature grab and go market featured in the Marquis’ two-story great room boasts a Bauhaus-inspired custom LED lighting grid by OCL. The grid illuminates the table tops created by a Chicago-based skateboard deck designer. Woven & Bound, the Marquis’ restaurant (paying homage to the history of American Book Co. with its name) transitions seamlessly from 2121 Pantry, with expansive space and warm, welcoming light from bespoke globe pendants by OCL. The pendants are also seen from Prairie Avenue via the hotel’s tall glass paneling. 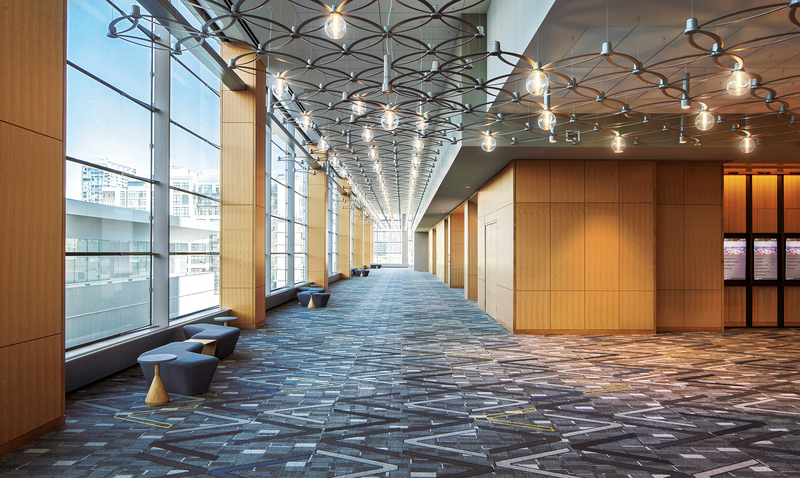 Filling the pre-function hallways on two floors are OCL’s custom interlocking petal fixtures. This one-of-a-kind installation was created from over 2500 laser-cut metal petals and arrayed with hundreds of LED illuminated glass globes and downlights. Additional custom OCL fixtures can be found punctuating hallways and meetings rooms throughout the hotel. The new Marriott Marquis Chicago, the largest Marriott hotel to open in 2017, is a stunning statement to the company’s bold new style and approach in designing their business properties. You can find the Marriott Marquis Chicago directly connected to McCormick Place – home of LIGHTFAIR 2018. Opened September 2017, Marriott Marquis Chicago is the city’s newest hotel, soaring 40 stories over the city’s lakefront and South Loop. The property boasts 1,205 stylish guest rooms and 93,000-square-feet of high-tech meeting space. 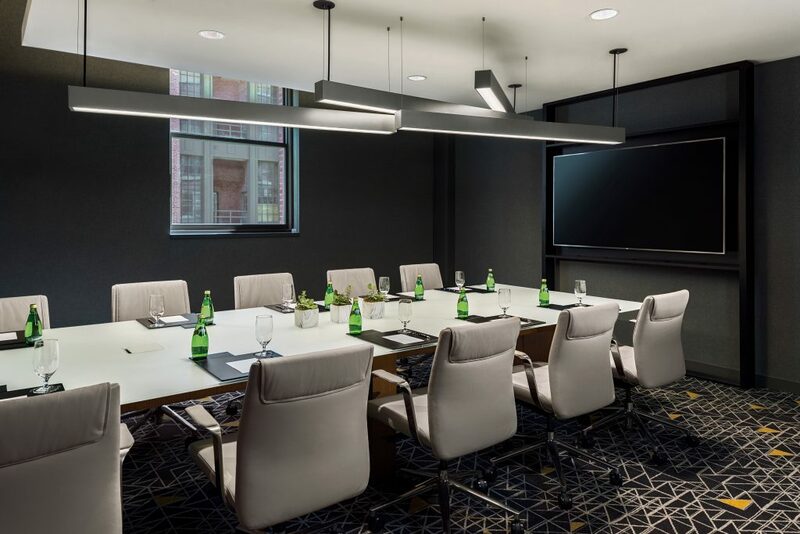 Directly connected to McCormick Place, Marriott Marquis’ prime location makes it seamless for meeting attendees from across the globe to gather in one place, while celebrating why Chicago is a city like no other. For more information, please visit www.marriottmarquischicago.com or call (312) 824-0500.